Your guide to customizing the dashboard that your learner interacts with. Dashboards give you the power to customize the learner experience in the app. If you are new to Dashboards, read this article to learn about how to create a Dashboard in Zunos. If you've built a Dashboard in Zunos with our previous tool, you'll notice some similar features in our new Dashboards builder. As you utilize the new builder, we recommend a few tips and tricks to ensure you're getting the most out of this powerful tool and all its capabilities. Upload your own image or choose a background color that matches your brand. If using an image, we suggest an image size of 2732px by 2732px for best clarity. If you don't have an image that large, just ensure the image you choose is square or you will need to crop it upon upload. The image will set the tone of your learner app experience, so choose wisely. Avoid background images that are busy, or brightly colored to avoid widgets and icons getting lost. If you like an image but are worried about the coloring, we suggest lowering the opacity of the image in the inbuilt photo editor if you are on a Mac or use Photoshop. Pro tip: Avoid using gradients that go from light to dark, as it will affect the visibility of your text. For additional information on ideal images, icons and other Zunos asset sizes, download the official Zunos Asset Creation guidelines below. Once you have your background image implemented, choose the theme. You have a choice of either light or dark. Feel free to experiment with this setting however as a guide we would recommend using the dark theme if you have a dark background, and using the light theme if you have a light background. Click on the widgets to add them to your Dashboard. You can customize the order by selecting your widget and dragging it to a new location. While you have the ability to pick up and drag your widgets anywhere you like, we recommend keeping a few widget locations front and center. If you're adding the image widget, add it at the very top of the page followed by your Engagement Summary widget. Additional widgets can be placed anywhere after that. Try not to clutter your Dashboard with too many widgets and icons! Your users shouldn't have to scroll down very far on the home Dashboard. Instead, add links to new pages or other Dashboards to keep everything neat and tidy inside the app. Simply click New Page and update the widgets and content links that you want to be accessible on this page. Pro tip: To save time, clone your current page by selecting the option from your Dashboard Editor. This will save you from reloading the background image and other widgets you want to keep on the Dashboard. Go back to the home Dashboard and link to your new page by using the Mixed Content Widget and select add link. Choose your new page from the drop-down menu. 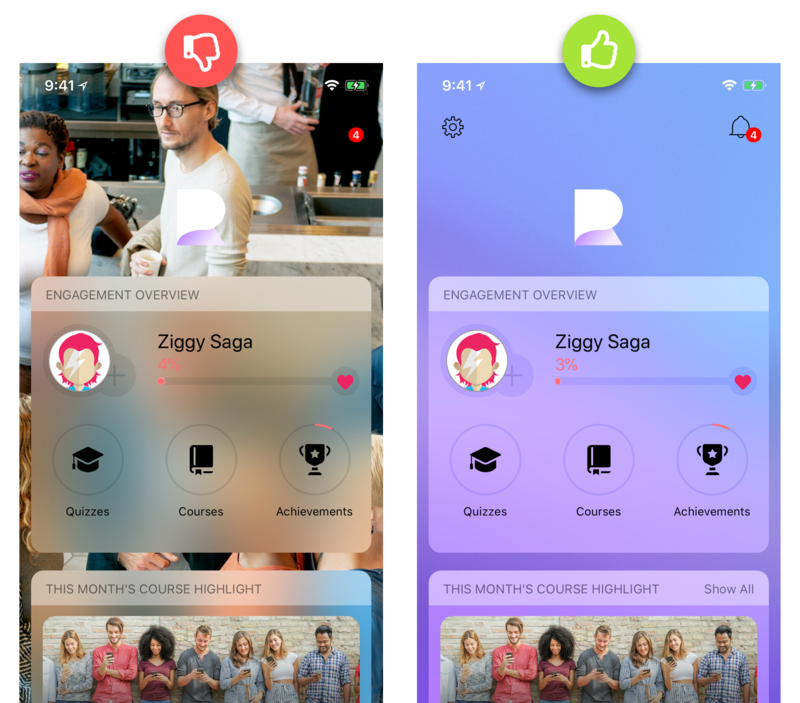 With the Mixed Content Widget you can also link to separate Courses, Content, and Achievements in order to show off new information or certain learning categories for your business. Do you have something important that you want your learners to see right away? On load allows you to schedule any item of content to pop up when the user opens the app. You can choose to have it shown once or daily. You can also add a number of content items too appear sequentially. Take customization one step further and provide a tailored learning experience for your users. Create individual Dashboards based on groups within your organization. In your Dashboard settings, you have the power to assign a custom Dashboard to a group or smart group. Once you assign a group to a dashboard, make it active and set it as the root Dashboard. All of the users in that group will see the new Dashboard the next time they log in to the app. Pro tip: The engagement score is set per organization level and cannot be customized on a per dashboard basis.